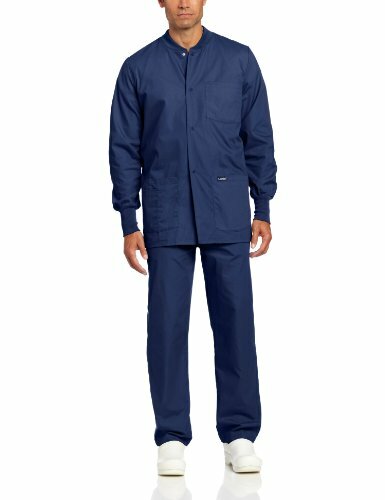 Add a functional layer over your uniform with this Professionals by Cherokee Workwear Men's Snap Front Warm-Up Solid Scrub Jacket. Knit cuffs and neckline emphasize comfort all day. Knit jewel neckline Snap front closure Long sleeves with knit cuffs Back yoke Two front patch pockets and interior cell phone pocket Side vents at hem 63% polyester 34% cotton 3% spandex poplin with 96% polyester 4% spandex rib knit Center back length: 30" This product can be shipped anywhere in the 50 United States Puerto Rico The US Virgin Islands and APO and FPO addresses. Sorry we cannot ship this product to any other address. Men's snap front, warm-up has two patch pockets and one chest pocket with matching knit cuffs. Center back length 31.50 inch. 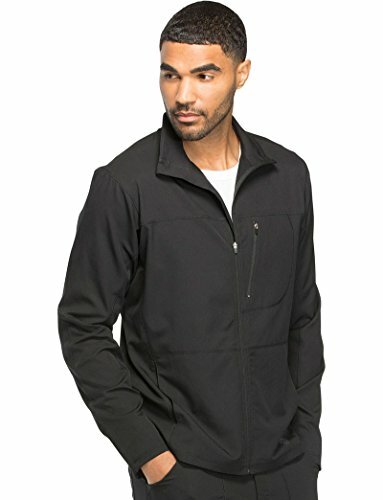 You'll want to wear this Revolution by Cherokee Workwear Men's Zip Up Solid Scrub Jacket from work straight to the gym. 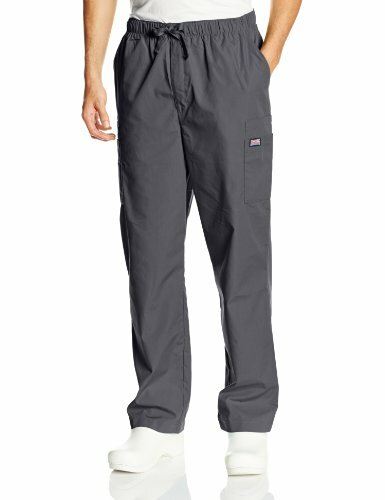 The easy care performance fabric and athletic details add extreme versatility. Stand collar Tagless heat transfer label at back neck Long sleeves with zip pocket at left arm and knit cuffs Center front zip closure Back yoke with locker loop Back vertical seaming Single chest welt pocket with bungee loop Two front patch pockets with interior pocket at right and pencil slot with logo loop at left Side vents at hem 78% polyester 20% rayon 2% spandex twill Center back length: 27" This product can be shipped anywhere in the 50 United States Puerto Rico The US Virgin Islands and APO and FPO addresses. Sorry we cannot ship this product to any other address. 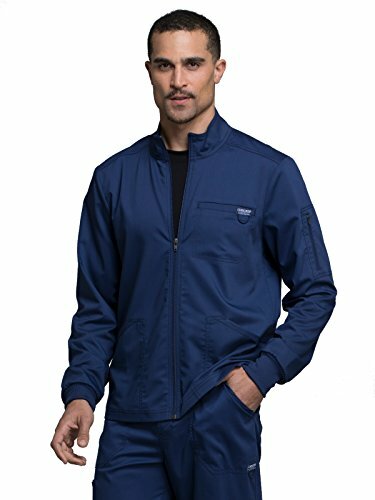 Athletic details will make the Dynamix by Dickies Men's Zip Front Warm-Up Solid Scrub Jacket your favorite layer. A cable routing outlet keeps you connected on the go. Athletic style Stand collar Center front zip closure Long sleeves with rib knit panel at cuffs Seaming detail throughout Cable routing outlet in pocket Slanted zip chest pocket Two front on seam slash pockets Lightweight strong and durable moisture wicking fabric that resists wrinkles 91% polyester 9% spandex 4-way stretch textured dobby Center back length: 27" This product can be shipped anywhere in the 50 United States Puerto Rico The US Virgin Islands and APO and FPO addresses. Sorry we cannot ship this product to any other address. 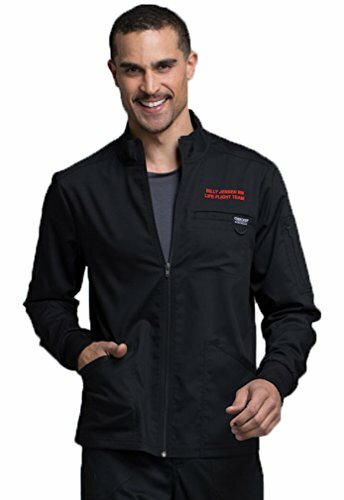 The Embroidered version of the Men's zip front warm-up jacket features a chest pocket with logo label and bungee loop, two patch pockets, a cell pocket, and knit cuffs. Also features a sleeve pocket with security zip closure, and back locker loop. Center back length: 27" Embroidery is available in multiple colors and fonts. You can see what the jacket will look like, before you buy it. Men's zip front jacket sports a lapel collar, chest pocket and two patch pockets. Center back length 30 1/2 inch. 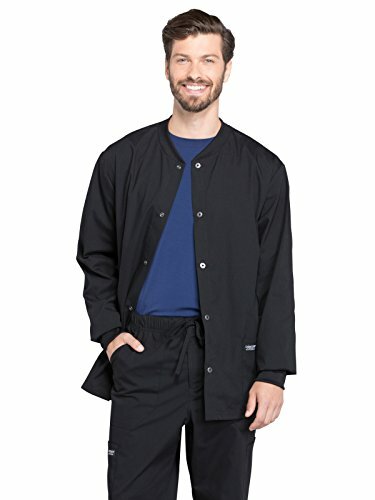 Looking for more Mens Scrub Jackets similar ideas? Try to explore these searches: Bold Floral Print Halter Dresses, Mens Premium Riding Gloves, and Gallery Tray. Look at latest related video about Mens Scrub Jackets. Shopwizion.com is the smartest way for online shopping: compare prices of leading online shops for best deals around the web. 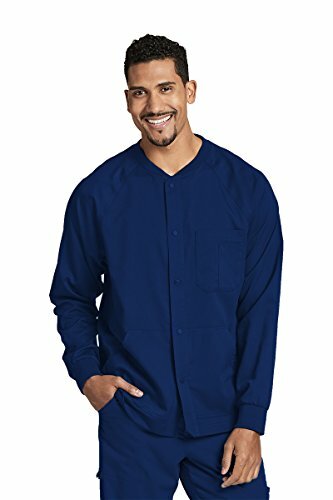 Don't miss TOP Mens Scrub Jackets deals, updated daily.